The FC Durham Academy Goalkeeper Development Program have been developed to ensure the "number 1" position is receiving professional, dedicated and committed training on a more consistent basis. All training is led by our new Head Goalkeeper Coach Eugene Alves and his experienced assistant coaches. 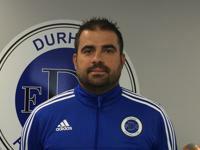 Coach Eugene is the former Goalkeeper Coach for Durham United League One Men and DRSA District Program and also played League One, US Pro and NCAA College. FC Durham Academy Goalkeepers are not required to register for this weekly technical training program. Goalkeepers not registered to play on an FC Durham Academy Team are welcome to register for our weekly technical training to supplement their club activities.